There is a temple near my hotel that was filled with monks listening to a service yesterday. There is a religious holiday this week celebrating the Buddha's birth, enlightenment, and death. 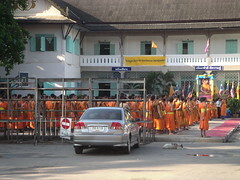 There is a lot of activity around the temples and the monks are eager to talk about it.